So, a good friend made through my Regional Music Heritage Center work brought me some things to digitize. Among them was this disc. I was amazed. I knew that PWK did LOTs of experimental recording but never knew he engineered records. My friend's name is Jimmie Allen, and he played with the Rule Beasley Quintet back in the 50s. 88 now, and still working both at his job as well as at jazz. Rule Beasley is a noted American composer from Texarkana now living on the west coast. His son, John, is a jazz orchestra leader and produced President Obama's last National Jazz Day program. There's a bunch more connections to these guys including Elvis Presley...but that's TMI and this is about PWK. Jimmie says this was direct mastered. While I know his memory is really good, I am not sure as I have this on reel to reel in stereo, made by PWK in 1956. However, I wasn't there and this is, while mono, a DELICIOUS disc that is basically in flawless condition and noise free. Best disk of this vintage I've ever heard. At minimum, as the hand appears to be that of PWK, I believe he mastered it from the tape at the Dallas facility referenced. The title "Ode to a Catfish" was a nameless Rule Beasley piece. Jim Hunter says that when PWK asked the name for the recording, Rule said it had no name and PWK promptly dubbed it "Ode to a Catfish." If interested, I'll record and post here. The other topic is chili. Gotten back to further work on my chili cooking, which we Texans pursue all our lives. Of course, many know I was born in Texarkana and raised on the Arkansas side. But if you have heard the world's first 45 rpm release by Eddy Arnold called "Texarkana Baby" you will be aware of those like me who claim dual citizenship and loyalty. Love'em both! Mom is from pure Hillbilly stock and my dad was a west Texas cowboy who rode fence and toted a .45. Don't get much more dual than that. Anyway, my dad carried chili powder, canned tomatoes, dry beans, onions, garlic and bacon for the days he spent riding fence in the trackless southwest. He carried a Winchester as well and would use it to shoot a deer on occasion for a break from beans. So, that meant chili. Learned the basics from him. Meat, chili, salt, onions, garlic, tomatoes sometimes...sometimes not. I've been all over the place over the years but getting back to the basics now. This pot was made from Bolner's dried cascavel arbol chili. This I stewed separately after removing the stems and dumping the seeds. Once cooked down, I pulverized them to paste in a blender then separated the bits of skin and seed remaining in the centrifugal juicer. That thing is amazing! Made in America to last a lifetime, I bought it used many years ago. I have a lot fine vintage appliances as you can't get stuff of that quality any more. Note the GraLab 168 behind it. Had it 45 years and you can hear it at a 100 feet. Anyway, the juicer is very heavy and spins up to probably 3,000rpm. You do NOT want one of these unless assembled properly balanced! Had this happen a couple of times and was BARELY able to hold it in place until it spun down (takes a while). Anyway, it gets the last bit of goodness from the chilis as I pour some hot water from the pot through as it spins. The yeild is beautiful sauce about the consistency of tomato sauce. I use about .5 measure of arbols (they are pretty hot) to 1 of cascavel (mild and flavorful). This batch had one 8 oz can of tomato sauce and a 10 oz can of Hatch chopped tomatoes and green chilis in it. Beyond that, cumin, smoked paprika, garlic, onion, masa, and chili meat (I often cut my own, but this came from WalMart who makes a pretty good grind). Cooked the basic last night and left outside to "tighten" and for the grease to rise and solidify. Removed the grease today and brought back to a simmer and added four tablespoons of masa that both thickens and provides that great bit of corn flavor that distinguishes a great chili, IMHO. Of course, many opinions on chili...but I only pay attention to mine! Oh...I often cook beans as it doesn't insult me if someone wants them. I want folks to be happy. Friend is coming over this evening and we'll be having this with hot corn tortillas, chilled Kosher dill spears, and beer. Doesn't get much better in January than that! Well, to tie these topics together, it would be even better if PWK were joining us this evening. First image is the PWK disk, second the vintage centrifugal juicer, third the chili last night before setting out to "tighten," the last as it heats after completion today. Oh man, I shouldn't have looked at this thread. I'm starving. Looks awesome Dave. Well, it taste tests pretty wonderfully. Since I have the master tape recording of the record referenced I figure I'll put on while we eat. ....and a good time will be had by y'all tonight. Even though it's without the pintos I put in mine, yea I know not TX style but I eat it! As I said, some here are violently opposed to beans in the chili. Not me. Once I've eaten a bowl or two, I put some in for variety and to stretch the goodness a bit. And I keep some around for those who want them. Beans are Texas, too, donchaknow. Beans and rice, beans, white onion, and cornbread, YEAH! Back in the day, Dairy Queens around here had all you can eat beans and hush puppies for a dollar at lunch. Smoked ham, beans & salsa, turnip greens & cider vinegar, cornbread, tea. That was New Years Eve and then day after here! Not sure where "CLT" is, but the food sounds like home! CLT is the airport code for Charlotte, NC Dave, used that for abbreviations ever since I worked nights at an air freight warehouse at MCO. This part of the south we put pepper sauce...hot green peppers in vinegar...on our greens. Black eyed peas, too. Love pot liquor from collards with black pepper on top! I like all kinds of chili so far. Around here, folks eat beans in it, but I’m partial to Texas Red. No beans. No tomatoes. No masa or rice or noodles or any other thing that you can find around the country. First time I had Texas Red I couldn’t believe how thick and rich the sauce was. I’ve spent years trying to recreate that first bowl of red. Haven’t done it, yet, but every chili batch I make is gone by the third day. And of course, it always seems better the 2nd day. Yeah, tomatoes are a bone of contention in Texas. The cowboys used them. I've made with and without. Not particular but keep the minimized as it's about the CHILIS. Basic is chilis, meat, onion, garlic, salt, and masa...I will NOT do without the masa! We know your limits now! My limits are a variation on my signature line..to wit.."If it tastes good, it IS good." I pulverized them to paste in a blender then separated the bits of skin and seed remaining in the centrifugal juicer. Chili looks good, there are many different ways to make it and very few are wrong. I really posted because of that juicer, that is cool, I have never seen one like that before, I can see why you say it needs to be put together correctly at those RPM's. It definitely looks like it is well built and will last, and possibly a little dangerous if you're not careful. and possibly a little dangerous if you're not careful. Yes, could be. No telling what might have happened if it had reached full speed off balance. Took everything I had to hold it down with full body weight in the full minute it took to spin down from perhaps two thirds speed. You got me started yesterday, had tortilla chips already, ended up with NY Strip marked down but not ripe at a better price than their 80-20 at the publix. 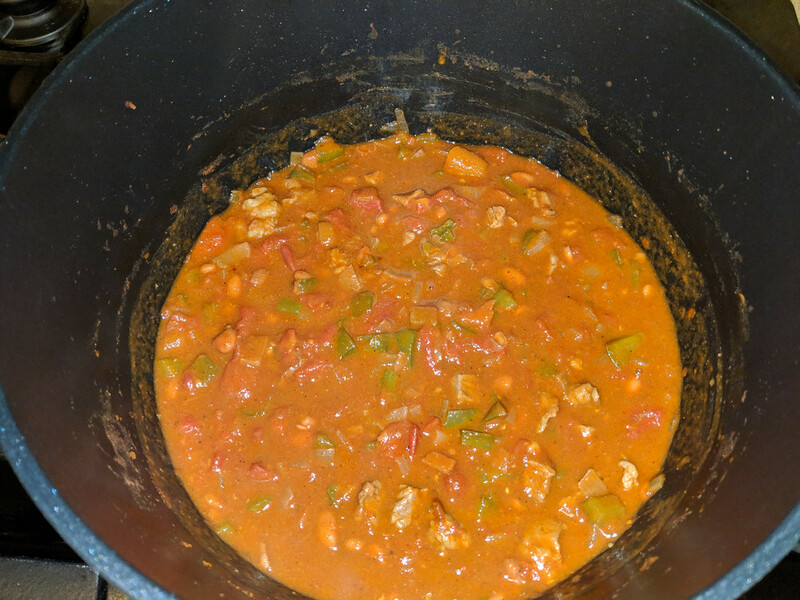 Cayenne and chili, onion & bell pepper, pintos, tomatos, S&P, + a clove. Put a dent in it after two hours, stuff off the sides makes it thicker! Wish I had a beer in the house though, love tea but it's not the same. According to a place we all went to years ago this is Cincinatti Chili, *"That Don't Confront Me" because it's very tasty with chips and sharp cheddar! *George T if you forgot that! Not me, my friend. Certainly Cincinnati and Chili are contradictions in terms down here for many, but remember: "If it tastes good, it IS good." If you are ever coming this way stop in and I'll give you the Texas red you won't find in Cincinnati. I would go so far as to suggest seeing if you can locate some dried chilies, arbol, cascavel, whatever, and experiment with extraction. 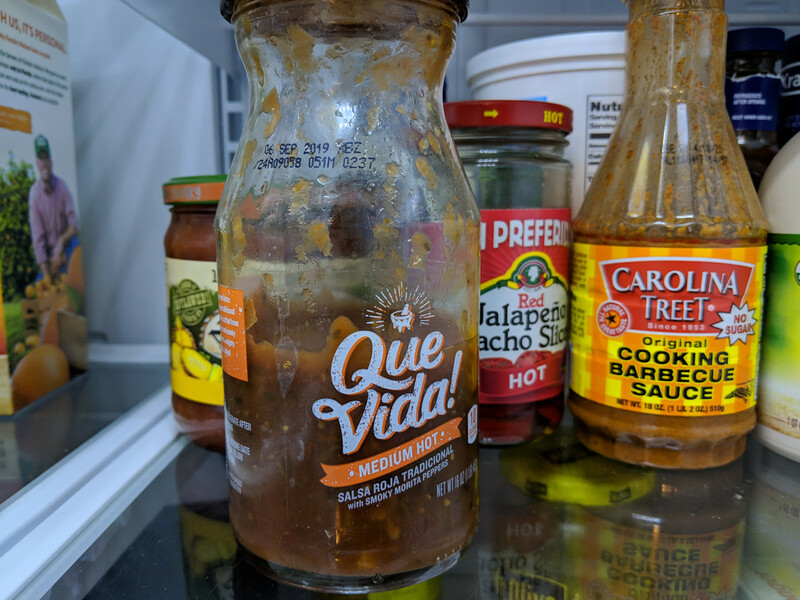 You MUST pulverize to near ketchup consistency and then filter through a tea or screen to remove the last bits of skin or you'll be picking it from your teeth...but it's the best way to get the best flavored chili no matter how you like to cook it. Of course, best quality comino is also fundamental. Also, you mentioned thickening. Down here we thicken and flavor with masa harina. A tablespoon dissolved in water per half pound of meat is about right. Stir it in when it's done, and then simmer for about another half an hour. I ALWAYS know immediately both by texture and flavor when the masa has been left out.